Why Govt could not control inflation? Why RBI couldn’t control inflation? Compiled by Office of Economic Adviser ->Ministry of Commerce and Industry. it’s calculated using Laspeyres formula. Earlier Government used to give weekly primary and food inflation data based on the Wholesale Price Index. But this practice has been discontinued since 2012. 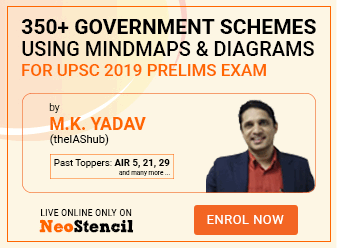 Last subtype was prepared by Central Statistical Organisation (CSO) -> Ministry of Statistics and Programme Implementation. Baseyear Different years for different subtypes. Common base year ( 2010) for all three subtypes. GDP deflator is calculated by Central Statistical Organisation (CSO)-> Ministry of Statistics and program implementation. GDP deflator is the most comprehensive number to measure inflation, but RBI /Government doesn’t use it much for policy making because GDP deflator data comes quarterly (and not weekly/monthly basis). Government Taxation, Expenditure, export bans etc. Govt. allowed duty-free import of white/raw sugar. Govt. imported pulses and edible oils and distributed them at subsidized rate. Govt. suspended futures trading in rice, urad, tur, guar gum and guar seed. Govt. banned exports of edible oils (except coconut oil and forest-based oil) and edible oils. Govt. imposed stock limits on certain essential commodities such as pulses, edible oil, and edible oilseeds and rice. Increased excise duty on gold. Govt. has been giving rice and wheat to poor families at very cheap rate under the Antodyaya Anna Yojana. Govt. allocated huge amount of foodgrain under the targeted PDS (TPDS). Introduced Rajiv Gandhi Equity Saving scheme (with tax benefits) to make people invest money in it, rather than in gold. Recently the government permitted FDI in multi-brand retail trading. This will improve logistical facilities connecting farmers with the final consumers and cut down the middlemen. The States of Madhya Pradesh and West Bengal have recently waived the market fee on fruits and vegetables. Such waivers are expected to promote investment private sector in the infrastructure necessary for transports and processing of fruits and vegetables. Budgetary provisions for improving storage and warehousing facilities, creating infrastructure for aquaculture etc. From above points, it seems Government did lot of things to reduce inflation. Then why are we not seeing any good results? Because, to fight food inflation, govt. started imposing ban on exporting some food commodities, increased and decreased the duties on import/export as necessary. While this may look a good solution for the short term but in long term, this creates uncertainty for businessmen, farmers. So indirectly, this affects employment and income of people => leads to more inflation. When Government puts ban on export of xyz item, that means India receives that much less foreign exchange (dollars). So this increases the Current Account deficit (CAD). When CAD increases = rupee weakens against dollar = crude oil become expensive for us = inflation in everything. Therefore, export bans are like firefighting / short term quickfix solutions. They donot solve the fundamental problems of Indian economy, infact they worsen it in long run. All Government schemes = leakage, corruption. And corruption =black money. And black money is mostly invested in gold and real estate. So demand of gold forever high= high current account deficit = rupee weakens against dollar= crude oil price increases = petrol/diesel price increases = even more inflation. Government did try to hike excise duty, make PAN cards mandatory for high value gold purchase and even thought of putting bans on gold import. But these moves have been heavily opposed by the jeweler lobby, hence Government has shied away from doing anything “radical” to stop the gold consumption. Besides a small hike of 2-3% in gold excise duty doesn’t prevent those bad guys with black money from buying gold! And Government hasn’t done much to stop the Black money / corruption either. You have read and heard this ten thousand times that FDI in multibrand retail = no middlemen = less inflation in food. And similarly cold storage, and food processing infrastructure= less wastage. But, suppose Government allows wallmart on Monday, that doesn’t mean from Tuesday Wallmart will start running and from Wednesday inflation will be gone. All these things take months and years to get file permission, construction, hiring and training employees, setting up supply lines etc. Many coal and mining projects are not cleared due to environmental issues. This has affected the electricity and raw material supply = input cost increased in manufacturing sector=inflation. Government is on the path of “fiscal consolidation” so it increased the prices of petrol, diesel and reduced the number of subsidized LPG cylinders. These moves have increased the inflation. CRR I’ve to keep this much cash aside. I cannot loan it to people. I donot earn any interest on this. SLR I’ve to invest this much cash in govt. securities, gold and reliable corporate bonds. Repo I’ve to pay this much interest rate, IF I take short term loans from RBI. Reverse Repo I earn this much interest rate, IF I deposit my money in RBI for short term. So what will be the impact on liquidity when RBI changes these rates? Note: RBI doesn’t need to change reverse repo rate, because they automatically keep it 1% less than repo rate. (1%= 100 basis points). In winter, the supply of green vegetables is high so their price goes down. But in summer, their supply is low, so price goes high. Same is the link between liquidity and interest rates. When liquidity increases = loan interest rate decreases. When liquidity decreases = loan interest rate increases = harder to get loans for home, car, bike, business. But It has been very difficult to do both these things at the same time. 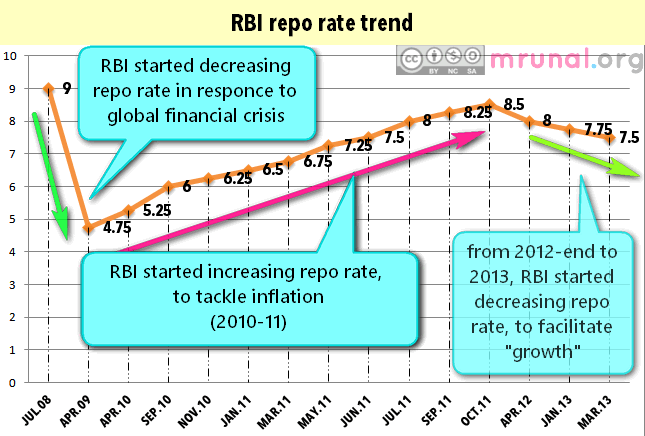 Because if RBI wants to control inflation, then it needed to reduce the liquidity= RBI had to increase repo rate, CRR. But this type of tight” monetary policy badly affects both producers (businessmen) and consumers. Why? But when repo rate is increased= liquidity decreased= difficult to get loans for home, car, bike etc.= demand down + difficult for businessmen to get loans = this hurts the businessman and whatever hurts the businessmen – also hurt the GDP and employment. credit (loan) to productive sectors of Economy and hence negatively affected the growth. But due to inflationary pressures, RBI followed tight monetary policy during 2010-11. During this period, RBI raised policy rate (repo rate) by 3.75%= repo rate was increased from 4.75 per cent to 8.5 per cent. Check the following chart. But this move has backfired: global economy was progressing slow (due to problems in EU, and USA not yet fully recovered) => so, this tight monetary policy actually contributed to a sharper slowdown of Indian economy than anticipated. GDP growth rate fell down from good 9+% to around 5-6%. 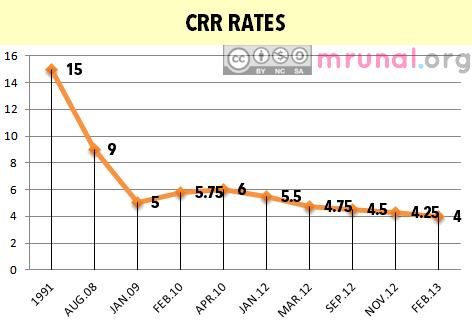 As you can see, between 2010-11, here too, RBI kept increasing CRR rates to curb inflation. But from 2012 onwards, RBI has started decreasing the CRR. As you can see, RBI hasn’t changed SLR much in last three years. We’re facing inflation because there is mismatch between supply and demand. While demand of those items (particularly food) is high (because population is high, the income levels of public has increased). Now think about this: What can RBI do? It can only increase the interest rates. While increased interest rates may decrease the demand of houses, cars, bikes but it cannot directly decrease the demand of food, milk and other essential commodities. In other words, Interest rates cannot change the dietary habits of people, not at least in the short term. Besides, high interest rates make it difficult for businessmen to borrow = less new projects = less new employment, less GDP. Therefore primary solution to fight India’s inflation =Increase the supply of food items. But this will requie thorough revision of the way govt. treats agriculture, allied activities, food processing and infrastructure. Small farms, disguised unemployment, heavy reliance on monsoon : all these issues must be addressed in comprehensive manner. So in that context, even if RBI drastically reduces repo or CRR, that won’t do much good to economy. tackling the “supply side bottlenecks” take months and years. So in the mean time poor people must be protected from the inflation. That’s why govt. needs to continue giving welfare schemes and subsidies. But such support must be “targeted” to the right beneficiaries: that’s where UID/Aadhar, Direct cash transfer comes into picture. Other than that, Government needs to continue pushing for fiscal consolidation, deregulation of sugar pricing (as per Rangarajan’s recommendations), and other policy initiatives. Rural to urban migration is an inevitable part of economic growth. But when people migrate from rural areas to urban areas, it creates pressure on civic amenities and housing (slums). Until recently, we did not have an index to capture the prices of residential buildings in urban areas. Hence “Residex” index was launched in 2007. This index records the changes in the prices of residential buildings. According to the RESIDEX, the housing prices have declined in Hyderabad, Banglore and Jaipur (from 2007 to 2012) but they have increased by more than 100% in Pune, Bhopal and Chennai. It classifies items into three categories 1) primary 2) fuel and fodder 3) Manufactured products and services. It is calculated using Laspeyres’ formula. CPI measures price change in both goods and services. WPI measures price change in only in goods but not in services. What is the formula for GDP deflator? It is a drug to combat swine flu. It is a new vaccine for rabies. It is an index to capture the prices of residential buildings in urban areas. It is an index to capture the prices of residential buildings in both rural and urban areas. Between March 2011 to March 2013, what was the highest Repo rate? Which of the following can be used to measure inflation directly?